Ben Roberts celebrates a try with Greg Minikin on his Super League comeback game. Following his nightmare injury plagued 2016 Ben Roberts is delighted to be back on the pitch with Castleford Tigers. The 31-year-old New Zealand and Samoa international made a successful Super League comeback when he looked sharp after coming off the bench to play 50 minutes of the game against Leigh and he has spoken about his relief at being able to play his part again. He said: “It was a good feeling. It was good to be back out there, playing with the boys, especially getting a win like that. “I am feeling good at the moment, just getting ready to get out there. I’ve had a long enough break so just want to play. “I enjoyed my first game, playing against a team like Leigh with their big following and it was a big occasion for them in their first Super League game. “I was looking forward to getting out there in front of our home crowd too. It has been a long pre-season and I am sure they were just as excited as us. “One thing I have learned from last year is never to take that winning feeling for granted. That’s the one thing I missed, or didn’t realise I missed until round one, having a good win with the boys and being able to celebrate that win. That’s a feeling I am definitely not going to take for granted. 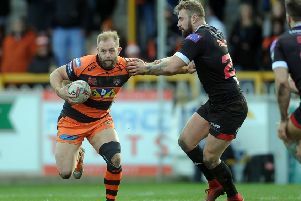 It was in an unusual role that Roberts made his comeback as he was used as a replacement and he looks set to get a substitute’s role again this week, but he is happy in whatever role coach Daryl Powell gives him. He said: “The big man has got a game plan and as long as I can execute that game plan and we are winning games I am happy with that. I’ve just got to bide my time and make sure I am ready when I do get a crack at a start. “I am probably most comfortable at stand-off, but I am happy to do what’s best for the team. If all 17 are doing their job as long as I am doing my job individually I am happy with that. “It was pretty frustrating. We did really well with the injuries we had, but just knowing we could probably have done better if we hadn’t had as many. After an encouraging start to the season Roberts reckons Cas are in confident mood for their game at Warrington tomorrow night. He added: “Training has been good. Our conditioner Coops is smart with the way he trains us. Having a tough game in round one there’s been a big build-up for this game coming. “All the boys are pretty excited. There’s a buzz about the boys getting out there and playing this week. “We’re looking forward to it and the boys are fresh and ready to go.